This page is a scrap book of photos, descriptions, and mementos of the club's past activies. 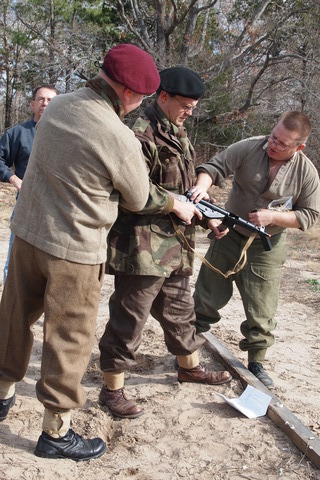 Training Event, Van, Texas. 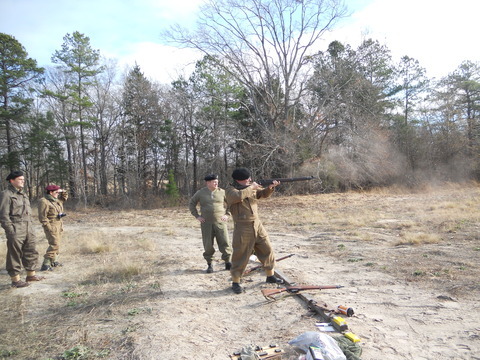 We started with small arms training, and conducted a formal range familiarization course, using live ammo, and training with everyone firing webley and/or enfield revolvers, enfield No. 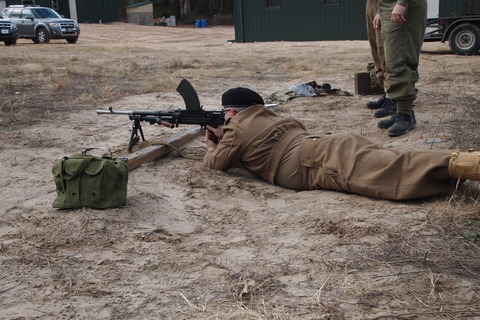 4 Mk 1 rifles, and the Bren gun, in both single shot aimed fire, and rapid fire to get a feel of what it can do. 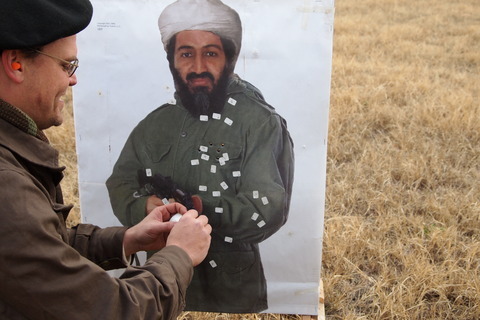 Targets were life size torso silhouettes of Osama Bin Laden set up at 25 and 50 meters. After the live fire, the Indianapolis BFONG sten Mk V was tested, and although it did manage to get a couple of full auto bursts out, it needs more work to get it in order. We then broke for lunch, and everyone had 24 hour rations from reprorations.com They are a pretty good deal, and will last someone for 24 hours if need be. ALOT easier then putting all the time and effort into making them yourself, especially if you have alot of other work to do in getting ready for an event. Al had some good input into easy improvements on them that can be done. After lunch we set up the mortar, and under controlled circumstances with three people manning the mortar and two down range with a range string tagged in 10 yard increments, fired 36 rounds of 12 each charge 1, charge 2 and charge 2.5 at angles of 40, 45, 50 and 55 degrees, to establish our firing tables for range and charge for the mortars. The rounds were inert orange painted (to make them easier to find) juice jugs full of flour to simulate mortar rounds. The data hasn't been averaged yet, but won't take long. The only problem we had was when the wind picked up, it had so much effect on the rounds that the second half of the table won't be accurate until we get another chance at a controlled firing to make the data better. Best range was charge 2 at I believe 45 degrees that got us 165 yards. 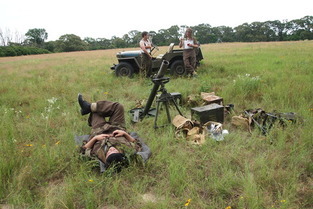 While we were working on our range tables for the 3", the Russes were working on the russian 50mm right next to us. 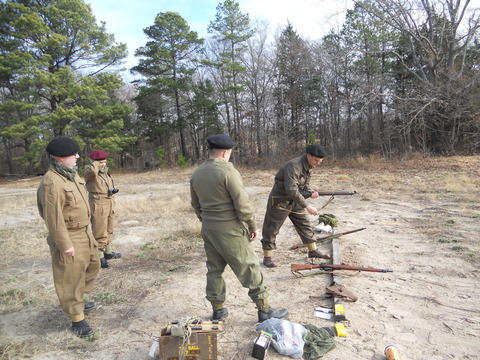 After establishing the range table data, we did another quick class on indirect firing procedures using a FOO. 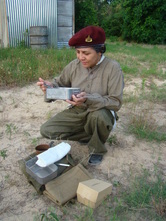 Then we set up the mortar in one field, and an Osama target on the other side of a woodline in the next field. Field phones were run out, and initially worked, but a short in the FOO's handset cord had us move to the backup system of the BC-611 walkie talkies, which worked excellent. Using the range table data, protractors, compass, The new improved version of the Van map, the field expedient clinometer we made because I didn't pack a real one, and radio communication, Al acted as the FOO while the rest of us set azimuth and range on the mortar, selected charge 2 jugs, operated the radio and fired adjusting rounds onto the Osama target. It was at extreme range, but we got a few close, and it was a really good intro to doing actual indirect fire procedures for everyone. After the mortar training, we broke for supper, and had compo rations of Meat and Veg, brown bread, pears, and beer. Saturday evening consisted of the new version of FUBAR, which went alot better than the first attempt. A 10 second time limit, and working on nothing but the british WW2 phonetic alphabet, we actually got something useful accomplished. We also purged the deck of a large stack of terms that we really wouldn't be using, such as all the australian slang, alot of african slang, and other terms that really wouldn't apply to us. The game went thus: with the next contestant up for a question holding a BC-611 walkie talkie, the previous contestant called them over another walkie talkie, and in a british accent, asked them the question. The person on the timer then hit 10 seconds, and within that time, the contestant had to respond over the walkie talkie, in a british accent, with the correct answer. Failure to do so resulted in a shot of Jameson Whiskey, and then the walkie talkies were rotated clockwise to the next contestant. It was quite entertaining! Sunday morning saw a breakfast of 24 hour rations, and a briefing on the new Tactical SOP, while demonstrating on the terrain board. 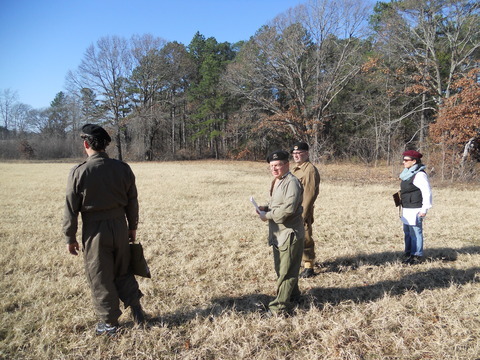 After the briefing, we conducted our TEWT (Tactical Exercise Without Troops), starting at the north end of the northeast field, and working our way clockwise around the property, ending in the west pasture by the west gate. I think it really made the training we've been doing up to this point fall into place really well for everyone. Mike asked us to terminate any hogs we saw while out on the TEWT, and we should have taken his advice and brought a couple of rifles with us, as we saw five hogs while on the TEWT. 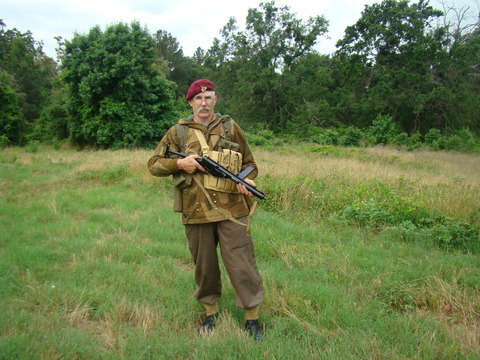 After the exercise, Al grabbed an enfield and I grabbed the bren, and we took a few live rounds and went back to the site of the hogs. By then, only one was visible inside the woodline, so we popped a few rounds at it without success. 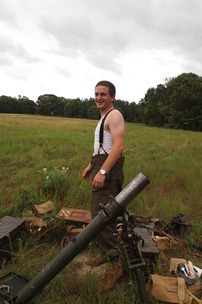 Holding a 23 pound bren up to your shoulder like a rifle and trying to hit anything is not a productive endeavor. It is, however, fun. Mike gave us a can full of old .303 ball ammo to shoot up, and after I run it through the tumbler, we'll be ready for our next shoot. We chipped in to give Mike a donation for his generosity and use of the facilities, packed it up for the weekend, and left the site. We left the terrain board there so that it's ready for any training we do there, and for the russians or anyone else who wants to use it. 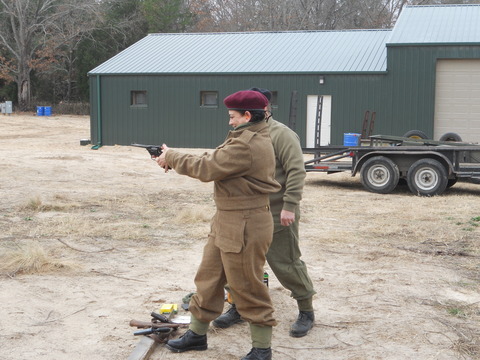 Saturday moring live fire weapons familiarization, beginning with Webley and Enfield revolvers. Lined up on the firing line are several examples of them, along with two models of Very pistols. No live fire for the verty's though! 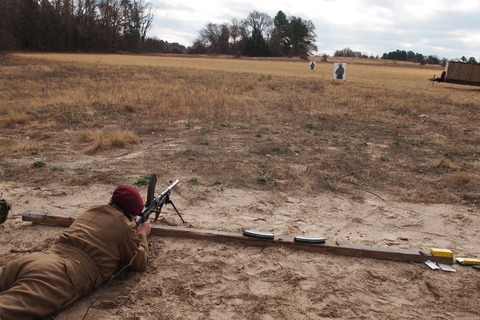 Below are fam firing of the Bren Gun, which is unanimously the club favorite, and our willing target guest for the day. 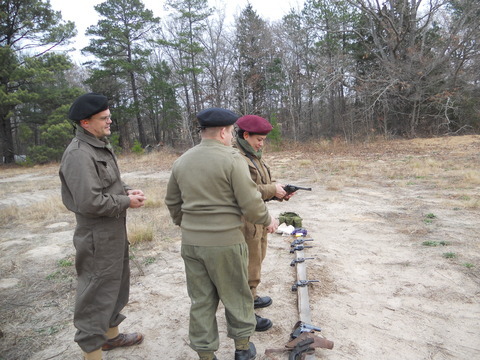 Last but not least on the range was one of Indianapolis Ordnance's BFONG sten guns, firing of course, blanks only. 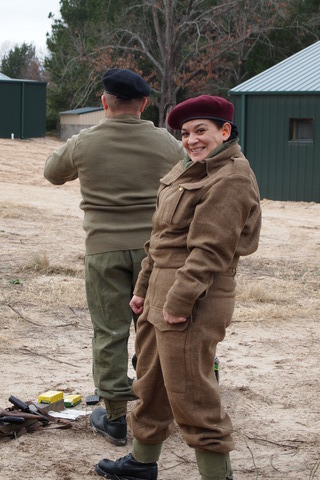 Above is the beginning exercise in the mortar training, which consisted of establishing range tables using three different charges and a field expedient clinometer, since both of the real ones were inadvertently left at home. 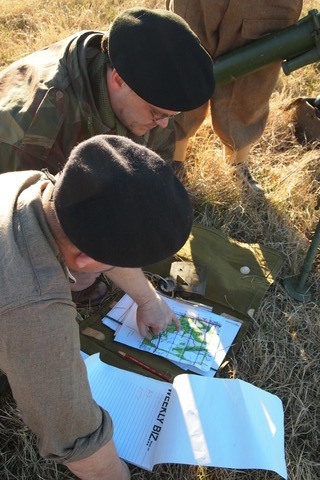 Below to the left is the indirect fire exercise conducted with a forward observer, with initial calculations being worked out on the map, and subsequent corrections being worked out based off the obervations sent over the field telephone from the observer on the target in the next field. 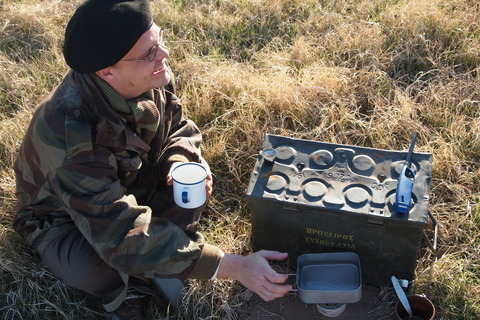 And brewing up a cuppa during the exercise, of course. 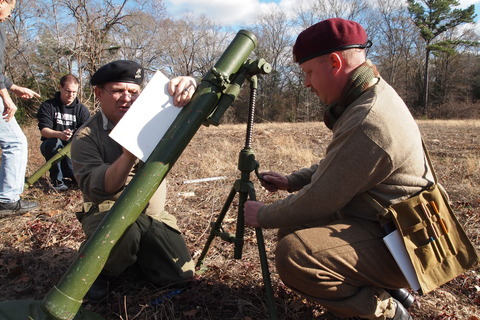 The russian mortar is a surrogate for training until our proper 3" is restored. Above is the preparation for the game of FUBAR, with the topic for the night being flash cards of the WW2 British Army phonetic alpabet. The question being transmitted over the walkie talkie from the questioner to the questionee, using proper RTO procedure and british accent. The timer was used for the 10 second response time, with the wrong answer being rewarded with a shot of Jameson. 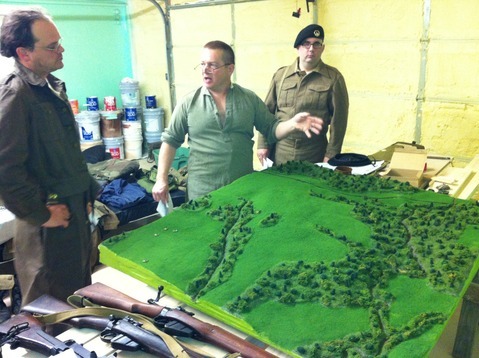 Below is the preparation for Sunday morning's TEWT being briefed on the terrain board, followed by the TEWT being conducted on the actual terrain. 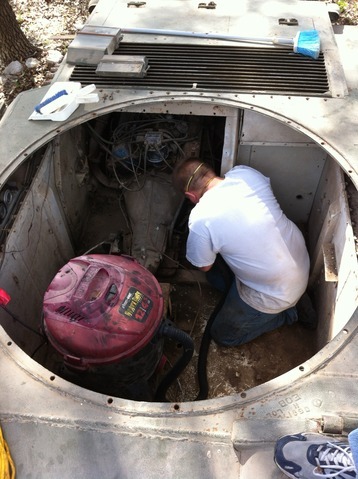 Maintenance Day, Georgetown Texas. Al came down on Friday evening with beer in hand, and we had some supper and headed to David G's, where Al had fun in Disneyland, and I toiled over how much investing in David's daughter's college fun I could afford. I was going to take photos of his airborne jeep, but realized I left my camera at home, so that was more of a recon than a fact finding mission. Discovered what straps and webbing I did and didn't have for the 3" mortar based off David's, checked out the trilogy of books on universal carriers that David has that confirmed I need them too, and then started putting money into the college fund. 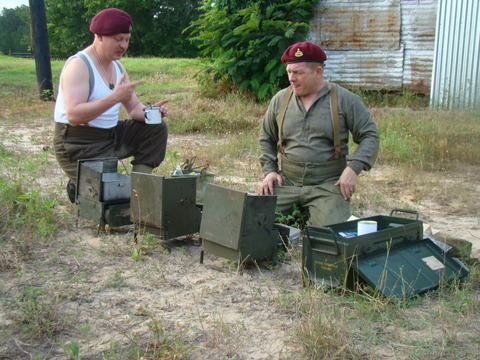 So now the vickers has belt, ammo, ammo tin, AFV ammo box, and I've seen the box cradle David G has and can make a copy of it. Got the proper jack for the Dingo from him, and flare locker, and not sure what else. Saturday Al and I had a good breakfast, full of sugar and fat to feed calories for moving big stuff, and then Al passed "Moving Big Metal Stuff 101" with flying colors. 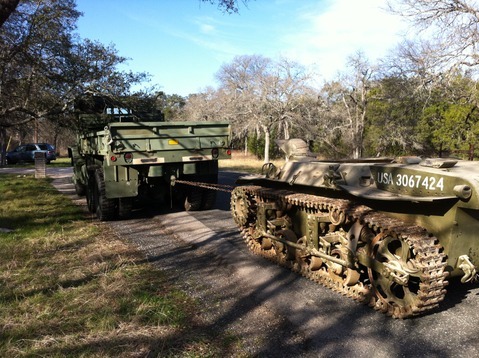 We got the M35 out of the way of the quonset hut, then moved the tank out of there and brought it over to the driveway, where we backed it in next to the garage. 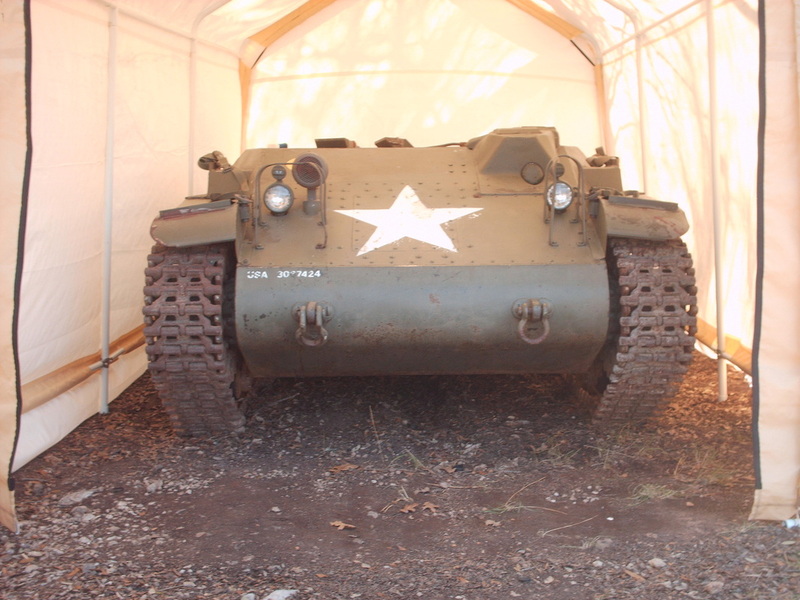 Then we went back and moved the T-16 into the quonset hut out of the elements. After that we gave the Locust a bath inside and out, with the inside needing more bathing, but it's a good start. Al power washed the outside, and after a good blasting, the Locust now has a nice camo job where the outer coat of paint is blown off and exposing the other shade of green underneath. Shoveling out all the crap from the flood inside with dustpan and brush, followed by shop vac, and then scrub brush with bucket of water, has proved that there is white paint in there. Engine looks good from the outside, and after swapping out fluids and cleaning the carb, we'll see what happens as far as getting it running again. After the bath, we put up the new portable garage over the tank, and it's now snug in its new temporary home. 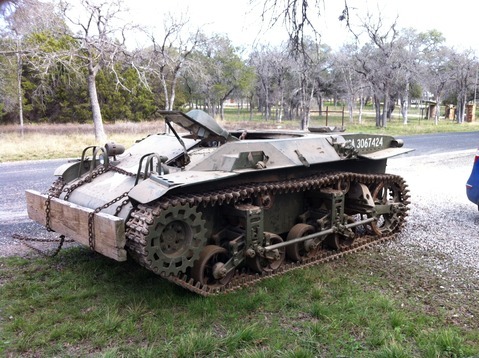 While moving the tank, before I realized that I hadn't fully released the brakes with the laterals, we discovered that the M923 5 Ton truck has no problem dragging a locust light tank with the tracks locked. It did to quite a job on the chain though. Never seen a 5/16 chain stretched to the point of all the links no longer moving freely. Quite interesting. So now the Jeep has it's own portable garage behind the garage, the tank has its own portable garage next to the garage, the dingo is about ready for reassembly, and as soon as the dingo is put back together and running properly, it will go into the portable and the tank will take it's place in the garage to start work on it. Al and I took a spin in the jeep on Friday night, and Al got some time in driving the 5 Ton on Saturday, so he's getting experience with that. A good weekend of progress. 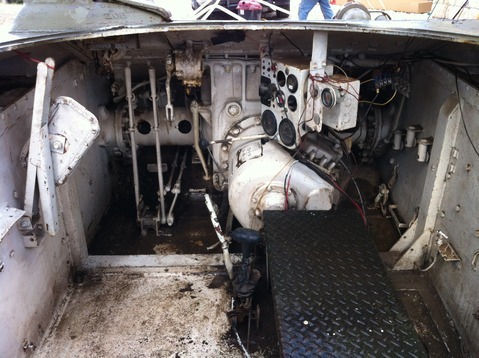 Top left to top right photos - pulling the tank from the quonset hut with the M923 5 Ton truck. 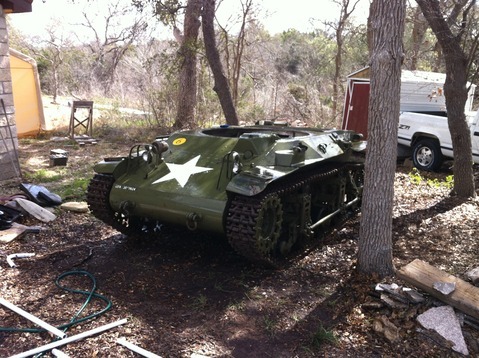 Moving the tank into position to back it in next to the garage. 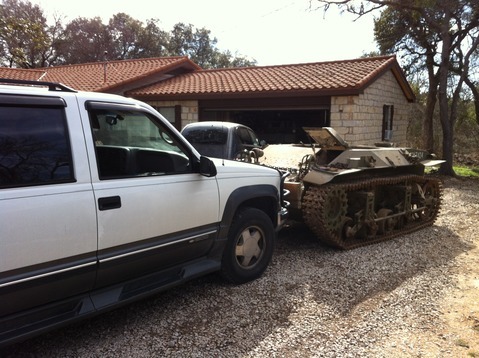 The tank ready for pushing by the Suburban. Pushing it next to the garage. Bottom left to bottom right photos - The tank in place and the brush cleared and ready to put up the portable garage over it. Cleaning out the hull. The T-16 carrier ready to be backed into the quonset hut. Lower left - Looking forward into the front of the tank after partial cleaning. Above - the jeep after a spind up and down the road. 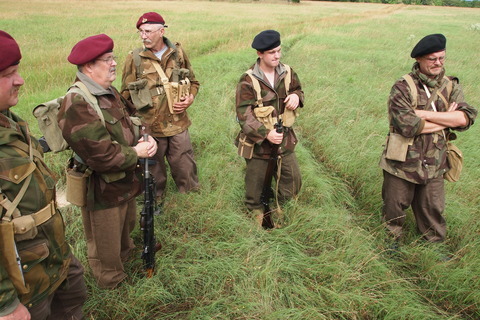 Operation Mush was the last major field training exercise that the 6th Airborne Divsion conducted before the invasion of Normandy (D-Day) on 6 June 1944. 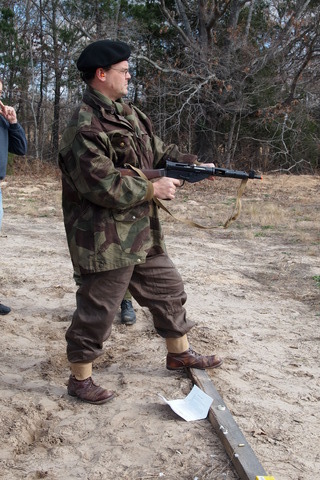 Our training event was modeled on that, as a 'dress rehearsal' for 6th AARR to refine its techniques before going into battle. Eight members of the club participated, divided into three teams for training, consisting of a 3" Mortar Crew, Assault Section and Support (Bren Gun) Section, who rotated jobs so everyone could get experience in all three teams. First call on Saturday morning saw the use of the WW2 pattern No. 2 Safety Cookers put into operation for the first time to heat the participants' water for their oatmeal and tea from their 24 hour ration packs, and for hot water for cleanup of mess tins and utensils. 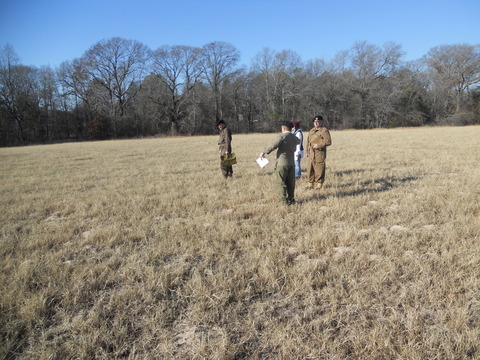 Following breakfast, the operations order was handed out, and read out loud during a briefing using the terrain model of the Van Texas training area. After a brief back by the participants, drop containers and panniers full of supplies were positioned scattered at different locations on the Drop Zone. 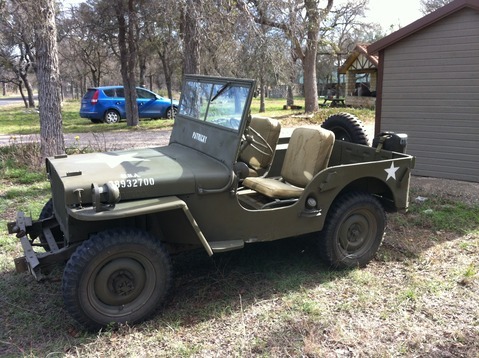 The jeep on its 'glider' trailer was positioned at the Rally Point on Landing Zone N, and the troops assmbled at the 'glider' for training on unshackling and unloading. Following deploying the jeep from the 'glider', the various sections were shuttled to the harbour while the remainder maintained security on the LZ until their turn to be shuttled to harbour. Upon arrival in harbour, the mortar team set up the mortar, the patrol leader took charge of setting up the OP (Observation Post) with field phone and wire, and the remainder set up the tents and sorted equipment as it came in from the glider. 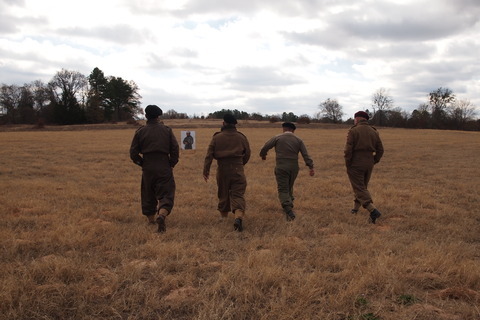 The first mission required each leader to train a trooper in map reading and land navigation, and while they drove, the trooper had to find the way to their assigned drop container or pannier. 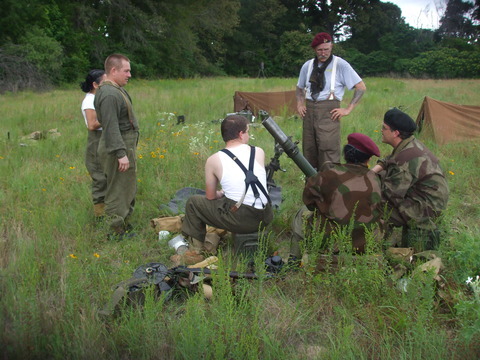 Everyone found their targets and recovered their supplies and equipment, which consisted of a Vickers Medium Machinegun with tripod and ammo, 5 gallon jerry cans full of water, and No. 2 Safety Cookers with fuel. The next exercise consisted of conducting indirect fire missions with the mortar and FOO (Forward Observation Officer) at the OP. 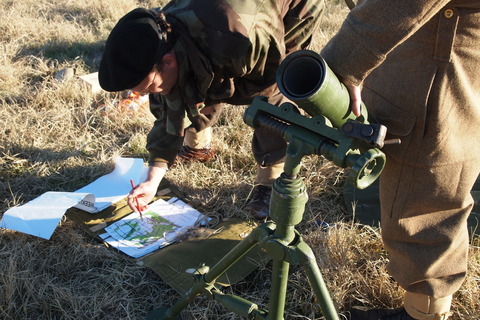 The FOO was required to locate the target, which was a dummy dressed up in german uniform located in the woods across the field from the OP, and engage the target using map coordinates and standard adjustments using the magnetic azimuth to the target and add/drop and left/right correction movements in yards. The mortar crew consisted of gunner and bombardiers, with the gunner receiving the call for fire and subsequent corrections from the FOO, and then plotting the target using grid and direction, then calculating the charge, azimuth and elevation for the bombardiers to set on the mortar. Although the target could not be seen by the mortar crew, as it was on the other side of a woodline between the harbour and the target, it was able to conduct basic fire mission using proper techniques, and only fell short of the target (named "Rupert") because of strong headwinds the rounds were hitting after clearing the tree line. Lunch was then had, consisting of 24 hour ration packs, with water heated on No. 2 Cookers for tea and washing up. After a break from the heat, which unfortunately reached 112 F from a predicted high of 94 F, more indirect fire training was conducted while rotating teams between the mortar crew and the FOO position, with fire guards ensuring safety from grass fires, while the third team rested from the heat. 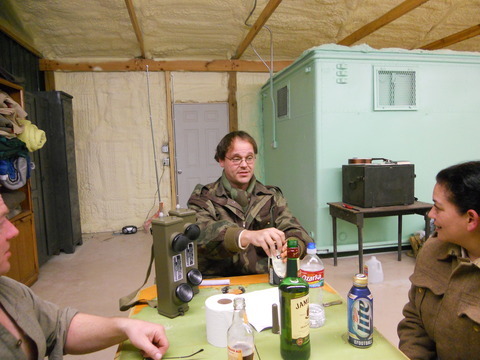 Following completion of the mortar training, which was quite successful, with the last two missions actually hitting the target with the first round without corrections, followed by Fires for Effect of 3 rounds per volley, we broke for supper. Supper consisted of Compo rations cooked on No. 2 Cookers, with Meat and Veg and canned brown bread. Due to the heat, the planned evening training in patrolling and pyrotechnics use was cancelled. 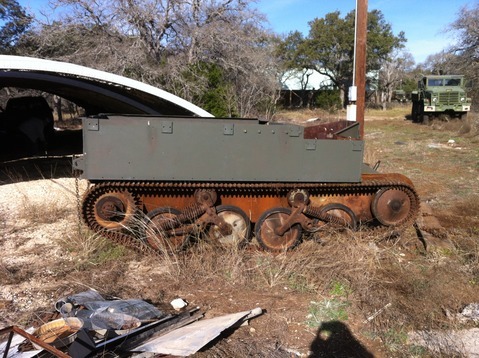 Following clean-up and loading, the Ha Go tank that was parked in the barn for a while with a blown engine, was loaded onto a trailer and taken to Arp Texas to have a replacement engine put in, and the Ha Go mock up removed, to begin its restoration back into a Universal Carrier configuration. Return on Sunday morning to Van saw the jeep loaded up for the trip back to Georgetown, and the recovery of three wireless 19 sets that had been worked on by Mike Gilbert. In spite of the heat, it was a very successful weekend, with a good time had by all. Clockwise from top left; Preparing breakfast on No. 2 Safety Cookers. Porridge and tea. Briefing the misson on the Landing Zone. Geared up and Ready to Go. 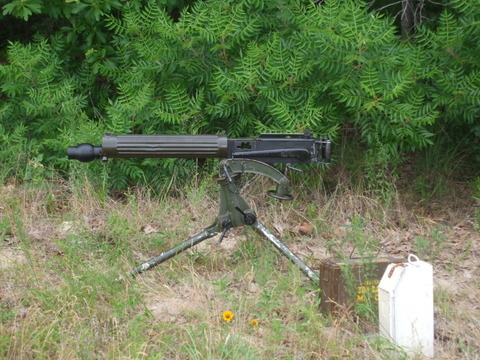 Vickers gun unloaded from a drop container. 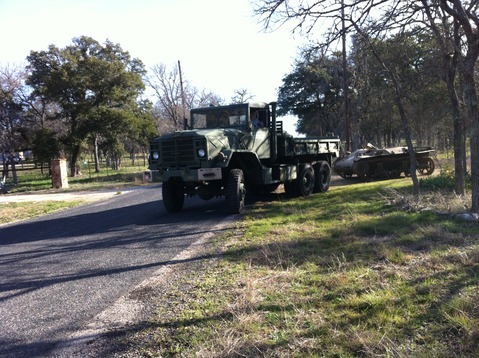 Mortar set up and waiting on a mission, jeep parked behind. Break from a fire mission. Relaxing in between missions, bivi tents set up in harbour in the background.